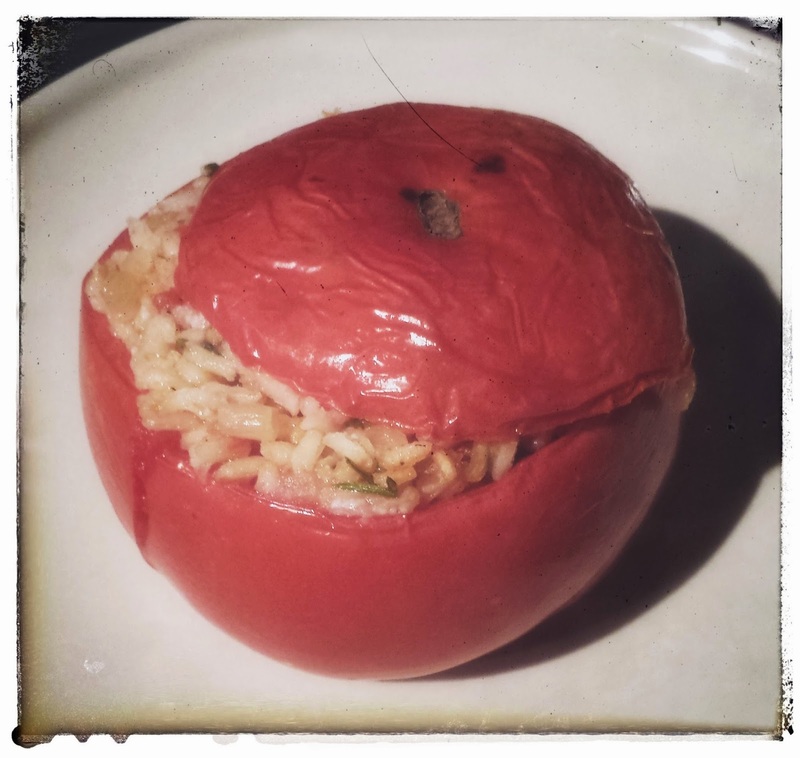 Stuffed Tomatoes–An Oldie but a Goodie! This is not a “normal” post for me! This is a health blog not a food blog after all Of course if you have been paying attention then you know that I firmly believe that food IS health. So here we are! Recently my father was nice to enough to bring us a giant basket of tomatoes of all shapes and sizes from his farm. When presented with large beefsteak tom’s the first thing my children request is “Stuffed Tomatoes”. I have been making a version of this recipe since I was 16, that’s over 20 years! After a month spent in Greece (at 16) I came home in love with this yummy side however in our house it is the main! Why eat this juicy fruit? Lycopene: a healthy phytochemical that give tomatoes their delicious colour. Lycopene has been studied for its connection to lowering the risk of cancer in men as it accumulates in the prostate and testes. More recently it is being studied for its oxidative benefits on bone health in post menopausal women. Regular consumption for 3 months was recently shown to decrease UV damage caused by the sun by up to 30%. Heart Health: Tomatoes have been shown to lower total cholesterol levels and help prevent clotting that leads to atherosclerosis. Neurological Health: Diets high in tomatoes have been linked to reduced risks of neurological diseases. The high level of phytochemicals in tomatoes may help combat obesity! Cut the base off of the tomatoes and reserve. Hollow out tomatoes, discard seeds and juice; finely chop the tomato flesh. Cook onions and garlic in 1 tablespoon of olive oil on stovetop over medium-low heat for 20 minutes. Turn up heat and add rice, stir fry for 3 minutes; add tomato flesh, salt and pepper reduce heat once more and simmer, covered for 7-10 minutes. Remove from heat, cool slightly and stir in parsley. Spoon rice mixture into tomato shells. Arrange in pan large enough to hold tomatoes and add 1/2 cup of water to bottom of pan. Place bottoms back on tomatoes as a cap, drizzle with olive oil. Bake at 375 F for 40-50 minutes until rice is fully cooked and tomatoes are tender. *Optional: before placing caps back on tomatoes cover rice mixture with cheese!